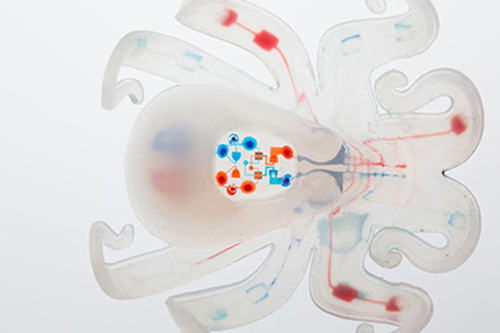 Wrap your measly human arms (and brain) around this one: Researchersat Harvard University's Wyss Institute designed an octopus-inspired, soft, autonomous robot powered by chemical reactions controlled by microfluidics. A reaction inside the robot can transform a small amount of hydrogen peroxide into a large amount of gas, which then flows into the octobot's arms to inflate them. 3-D printing was a crucial component of the design process, as it allowed the researchers to successfully integrate soft components.